We hear a lot about heart disease because it is common in humans, but did you know that it can also affect your pet? Both dogs and cats can also suffer from heart disease, which leads to congestive heart failure. Fortunately, pets can live for years with heart disease when receiving proper treatment. AERA wants all pet owners to be able to recognize the signs of heart disease as well as understand the disease. Valvular: An abnormal heart valve leads to an enlarged heart. Myocardial: The heart muscle becomes thick or weak. Arrhythmia: A condition that causes an irregular heartbeat. Pericardial: The protective sac surrounding the heart fills with fluid. Infectious heart disease: A parasitic infestation that damages the heart, lungs, and arteries, with a common example being heartworm. Congenital: A birth defect in which the heart is malformed that can lead to heart enlargement. While congenital heart disease develops before birth, acquired heart disease is most common in middle to older age dogs and cats but can occur in all ages. Preventative care is the best thing you can do for your pet. One easy way to prevent some forms of heart disease is to make sure your pet is always up-to-date with heartworm prevention. You will want to bring your pet into the veterinarian for an exam at least once a year until the age of about eight or so. However, after this point, you will want to start coming in for these physical exams at least twice a year. Catching heart disease early is the best way to prevent damage from heart disease. While heart disease can feel like a scary prognosis because it can’t be cured, it is manageable. With the help of a veterinary cardiologist, your dog or cat can live a happy, healthy life. What are the Symptoms of Heart Disease in Cats and Dogs? In cats, you will also notice that your cat has a tendency to hide when injured or ill. The same goes for cats with heart disease. 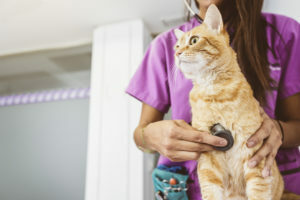 To be diagnosed, your veterinarian may need to perform several tests on your pet which may include blood and urine tests, auscultation (listen to the heart with a stethoscope), chest x-rays, an electrocardiogram (ECG), and/or an ultrasound (echocardiogram). These tests allow the veterinarian to assess the condition of the heart and determine what is going on in your pet. If your pet is diagnosed with heart disease, you should take him or her in to see a veterinary cardiologist. In conjunction with your primary care veterinarian, a veterinary cardiologist can help develop a routine that will keep your pet at its healthiest. A recent study in dogs documented that those with congestive heart failure who see both a primary care veterinarian and a veterinary cardiologist live 75 percent longer than those who don’t get proper heart care. Since heart disease can’t be cured, it is important to get your pet on a regimen approved by a veterinary cardiologist. Often, a veterinarian will want to switch your dog or cat to food that is low in sodium to help reduce fluid build-up in the heart. Your pet’s cardiologist may also give you a list of approved treats and human foods that are safe for your dog or cat. Along with diet, your veterinary cardiologist might recommend medications and supplements. Angiotensin-converting enzyme inhibitors (ACE inhibitors) can help improve symptoms of heart disease. Diuretics can also help dogs and cats dealing with heart disease. Diuretics remove excess fluid in the body by getting the fluid into the kidneys to be removed as urine. Vasodilators, which dilate blood vessels to decrease the amount of pressure on the heart, can be beneficial to unrestricted blood flow in pets with heart disease. Drugs called “positive inotropes” are prescribed to pets with heart disease to help the heart pump stronger to get more blood into the lungs and other parts of the body. Which Breeds are Most Susceptible? Like with most other diseases, certain breeds of cats and dogs are more susceptible to heart disease than others. The most common forms of heart disease are chronic valvular disease and primary heart muscle disease. If your dog or cat has been diagnosed with any form of heart disease, working closely with a veterinary cardiologist can improve quality of life and even lengthen the projected lifespan. AERA’s cardiology team has seen many cases of heart disease. Every pet is different, so treatment plans are different for all pets. If you live in the Fairfield, New Jersey area and you’re looking for a board-certified cardiologist for your pet call AERA today at 973-788-0500. We would love to make an appointment for you to speak with our experienced cardiologist.